China's doctors: overworked and underpaid? On the first week of a new law issued by the Ministry of Health which permits doctors to practice at multiple medical institutions, not a single doctor applied to register at the Beijing Municipal Health Bureau. The new law, released on March 7, is meant to provide stronger incentives for better quality healthcare through offering doctors more flexibility in their sources of income. Reforms began in 2009, when the Ministry of Health revised a long-held rule under the Medical Practitioners Law that a doctor is only permitted to register for work at one medical institution at a time. But the reality has proven to be less than encouraging. Long before the law was issued, well-known doctors at major hospitals said they would recognize each other at large airports on the weekends as they flew off to their other jobs. This phenomenon is particularly common in Beijing and Shanghai, where the best-trained doctors tend to cluster. According to the new regulations, one essential piece of paperwork when applying to practice at multiple institutions requires permission from both the hospital director and medical affairs office. Dr. Wang Xiaomin, director of the Peking University Dental Hospital stated that, while called "public hospitals," only a very small portion of funding for these hospitals comes from the government. Hospitals rely on income from drug prescriptions and medical examinations and have been reluctant to see their doctors find work at other institutions. Additionally, since 2005, all doctors at public hospitals have had to purchase malpractice insurance, and this is tied to the hospital at which a doctor practices. There are no malpractice insurance requirements under the new regulation for secondary or third-practices set up by doctors. Some specialist physicians have clearly stated that they won't opt to practice in multiple locations because they are simply overworked. Many doctors are currently working at full capacity. In the city of Beijing, China's medical center, doctors are particularly overworked. 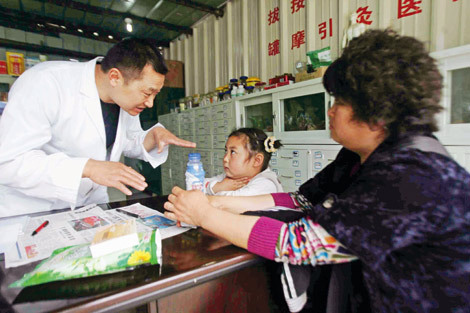 From November 15, 2010, the Beijing municipal government has pushed for citywide weekend outpatient services, which has alleviated wait times for patients – but created a strain on the schedules of doctors. Zhao Ping, president of the Chinese Academy of Medical Sciences, said that the work efficiency of Chinese doctors is high enough. "There are on average 1.4 doctors to a bed, which is probably the lowest in the world," Zhao said. "If doctors are unwilling to work multiple jobs, if there is money to be made that they don't want to make it, then that is only because they're too exhausted." But Yin Jia, director of Beijing Union Medical College Hospital's allergy department, said that the new multiple-job policy encourages doctors to crossover to county-level hospitals or community clinics. The policy won't be attractive to the country's top doctors, especially because there isn't a different in compensation. "Registration fees and treatment costs are basically the same as at Beijing Union. When they are already overworked, these doctors won't be motivated to travel for the same pay." During the most recent legislative sessions in Beijing, a Chinese People's Political Consultative Conference (CPPCC) delegate said that nationwide drug sales commissions are as high as 45 billion yuan last year. "That so many people are getting kick-backs indicates that our system of ‘drugs support the hospital' and ‘examinations support the hospital' has problems. One important reason is that doctors now can't live a dignified life commensurate with the value of their labor on their legitimate income alone,'" Yin said. Asclepius (Ailibi) Consulting Inc. Chairman Eric Chong said that this phenomenon reflects contemporary culture's indifference to the value of knowledge: the intangible knowledge and abstract experiences of doctors can only be reflected in tangible things, such as medication and examinations. But Peking University School of Government Professor Gu Xin told Caixin that the problem lies in the contracts that doctors are permitted to negotiate. In most countries, doctors are not confined to practicing for their hospital, and there are several options for practice arrangements. Gu said that behind these different practice models are different types of "contracts" between hospitals and doctors. But most doctors in China are not eligible to negotiate for other types of contracts with hospitals. "To reach a fair contract, doctors should have the freedom to practice where they choose," Gu said. "Under this, there should also be a direct employer-employee relationship between hospitals and doctors." Gu said that the current healthcare system keeps doctors unnecessarily tethered to one hospital, likening it to birds trapped in a cage. Gu said that if doctors aren't allowed to move freely between medical institutions, the reform to promote doctors working at multiple practices will simply "turn one birdcage into two or three."